International in her appeal, Nadine Gordimer is an original and accomplished novelist whose works have found literary and popular recognition. In this critical study, first published in 1988 and the first by a woman, Judie Newman discusses all Gordimer’s novels, including A Sport of Nature. Gordimer’s writing is both political committed and formally innovative, confronting subject matter of great contemporary interest and at the same time seeking out narrative forms that combine European and indigenous culture. Her novels are sensitive to their context, while also offering an important contribution to postmodernist reassessments of narrative poetics, and a challenge to European conceptions of the novel. 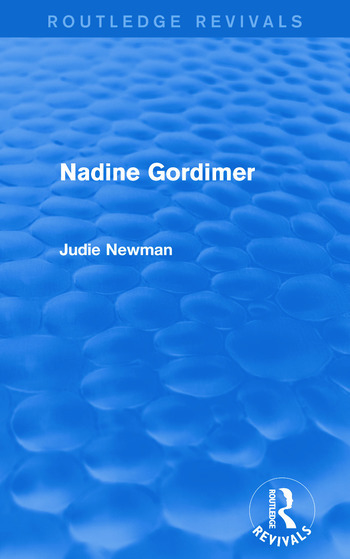 Judie Newman places particular emphasis on Gordimer’s searching investigation of the relation of gender to genre, and explores other major concerns such as the crisis of liberal values, the nature of historical consciousness, racism, sexual politics, and the psychopathology of power. Her study combines close literary analysis with a wide-ranging exploration of ideas, showing clearly how the artist can contribute to contemporary debate.